The six arrows represent the six great warfares first espoused by Nationalist Chinese leader Chiang Kai-shek: Ideological warfare, Stratagem warfare, Mass warfare, Intelligence warfare, Organizational warfare and Psychological warfare. 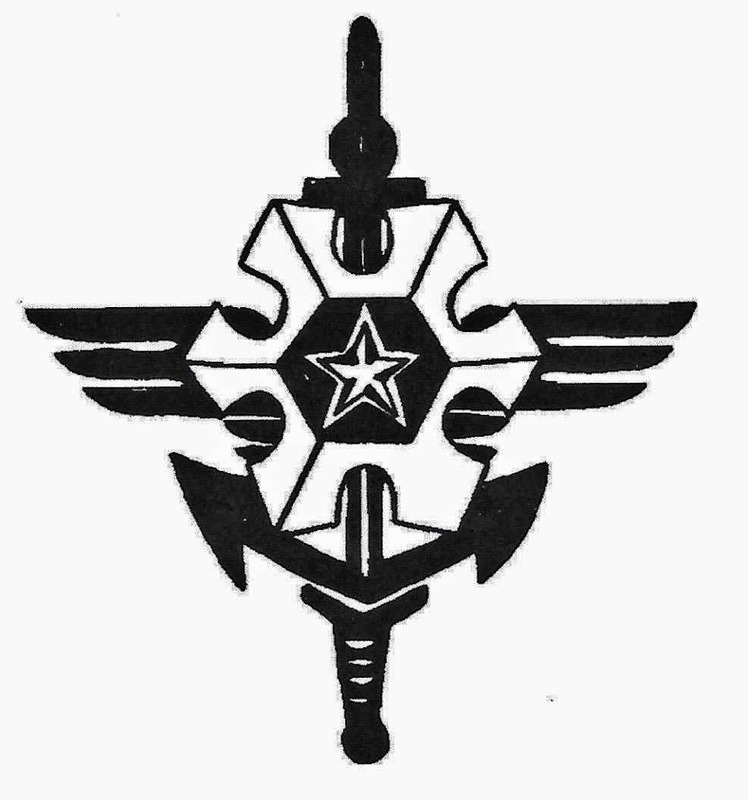 The Political Warfare insignia is a badge, worn above the right breast pocket, which consists of a silver star symbolizing leadership, surrounded by a hexagonal design symbolizing Chiang Kai-sheks Six Great Warfares, superimposed on a sword, anchor, and wings which symbolize the role of the Army, Navy, and Air Force in the carrying out of the six warfare missions. When I was in graduate school in 1966-1967 I had already received a commission from the ROTC. I signed on to the 351st PSYOP Company in the Bronx to make good reserve time and to attend summer camp at Ft. Devens and the commissioned officers PSYOP course at Ft. Bragg. I got orders in spring 1968 to report to Ft. Benning and Ft. Bragg. The 351st had a permanent duty station Ft. Bragg from 1968 to 1969 and as a newly minted 2nd Lieutenant I did some Project Jilli leaflets for North Korea there. We printed many pallets of them as I recall. We used the two color web presses as well as a few larger presses and the old standby Multilith. Much of the technology we used is obsolete now. Pollock enjoyed shooting pictures in the field, both for personal growth, love for Vietnam and for his job as advisor. He could shoot 35mm transparencies and process them in the GPWD's photo lab. He took many "stock" photographs, developed them himself, filed them and made them available in case the unit propagandists needed images for PSYOP projects. It was a great way to mix business with pleasure. There were a few times when we would go out on a photo shoot to Flower Shows, Art Exhibits, Vietnamese Army unit Public Relations affairs, various embassy events, street scenes, pacification scenes, or just to take stock photos for upcoming publication and for our own personal access to places. As I seem to recall we would wear the pocket badge on the pocket under our name tag or a button in the middle of a white dress shirt. The fabric patch is printed on what looks to be cotton in between two clear plastic sheets sewn around the edges with white thread. This is a wonderful propaganda image. It depicts a smiling soldier with his rifle showing that he is ready to fight to protect his nation, and yet he also holds a white dove representing his desire for peace and not to have to fight against his fellow Vietnamese. 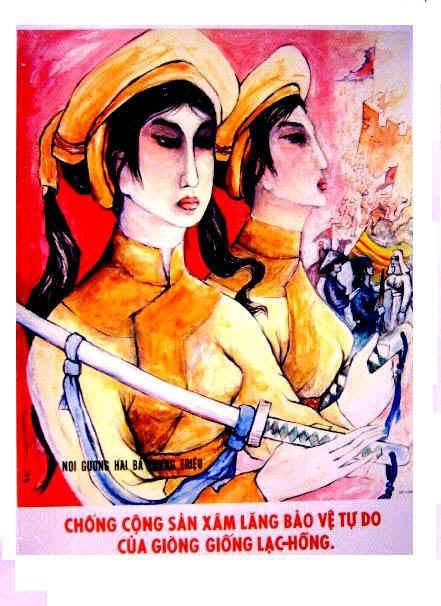 The Political Warfare (POLWAR) concept, as introduced to the Republic of Vietnam in 1960, was copied from the Nationalist Chinese system. At that time, President Diem traveled to Taiwan where President Chiang Kai-shek explained the Nationalist Chinese concept. At President Diem's request, a team of Chinese POLWAR Officers was sent to the Republic of Vietnam to teach courses in POLWAR to selected RVNAF officers. On 5 May 1965, the Political Warfare Advisory Directorate was established as a separate element of the Military Assistance Command-Vietnam (MACV) staff to advise and support the General Political Warfare Department. After several reorganizations, the POLWAR advisory function was performed by the Political Warfare Advisory Branch, Psychological Operations Division, J3 (Operations), MACV. The Vietnamese Army members of the unit wore this patch on their fatigues on the left side shirt pocket under their name. The Americans generally did not wear it. If they chose to do so it would be placed under the subdued MACV patch on their sleeve. 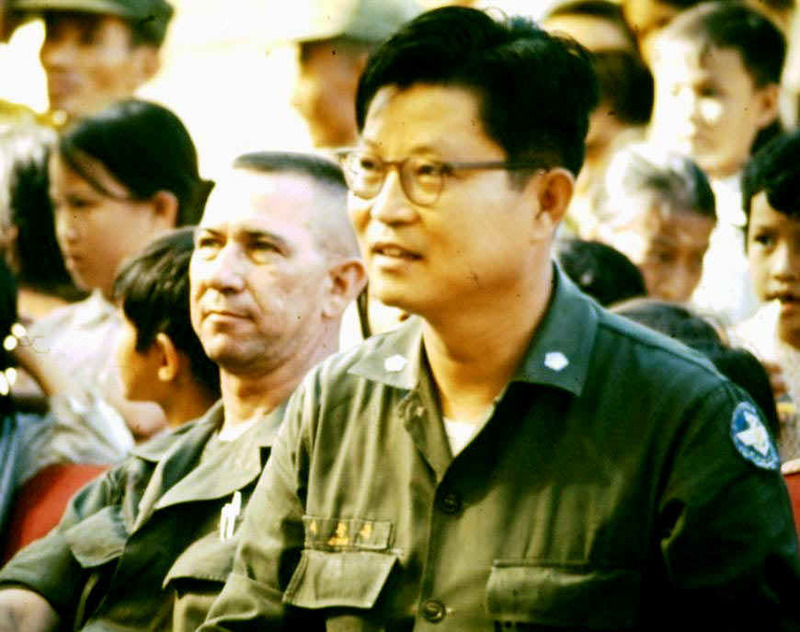 The General Political Warfare Department is responsible for developing and implementing POLWAR programs within the Republic of Vietnam Armed Forces (RVNAF) to accomplish the POLWAR missions as follows: The first mission of the GPWD was to create and maintain the loyalty of the RVNAF to its leaders, nation and national ideology. The second POLWAR mission was to gain and maintain the support of the civilian populace. The final mission of political warfare is to break down the loyalty of the enemy to his leaders and cause him to desert the enemy or rally to the government side. When the GPWD needed help with printing, planning, or technical advice they had a number of U.S. PSYOP units ready to help them. Their major asset was the 7th PSYOP Group on Okinawa. The 7th PSYOP Group was organized and staffed for tactical and strategic PSYOPS. The 14th PSYOP Battalion was the tactical deployable element and included mobile printing capability, mobile radio capability, and tactical loudspeaker and audio-visual teams. The Battalion controlled the 7th PSYOP heavy printing facility. However, approximately 50% of the 7th PSYOP printing production was accomplished by United States Information Agency printing facility, RSC, Manila. The 15th PSYOP Detachment (A battalion-sized organization) was the strategic element. This unit provided planning, analysis, research and intelligence, and assessments of all countries throughout the PACIFIC. 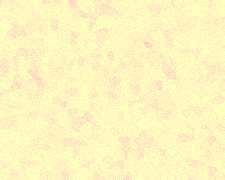 This element was involved in the Psychological Automated Management Information System which is a computerized quantitative data bank of communist country propaganda output. On a trial basis the GPWD output was being included to assess, hopefully, the effectiveness and provide information concerning GVN propaganda output. The 244th PSYOP Detachment (would later become a company, and then a battalion) was a small local unit responsible for Southeast Asia propaganda production. This Detachment was staffed by writers and illustrators from SEA. The majority of the Vietnamese staff served formerly with the Joint United States Public Affairs Office. 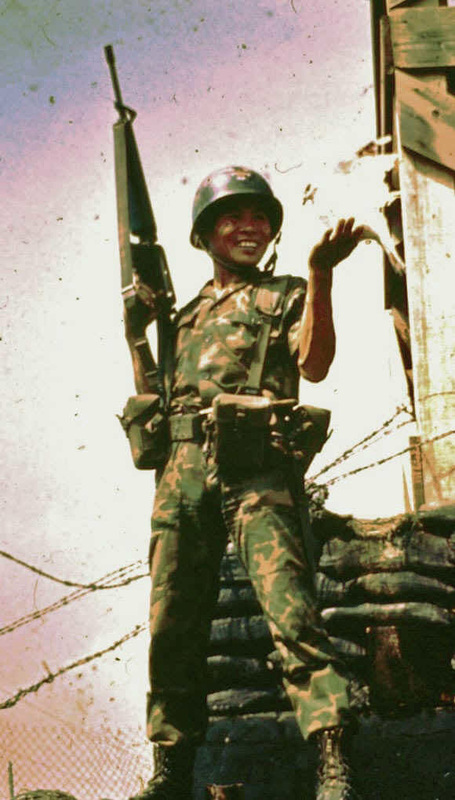 This unit obtained support from the 15th PSYOP Detachment and produced operational propaganda material with current emphasis on printed matter for Cambodia. The POLWAR compound was made up of many French-era buildings housing the headquarters, various media outlets and services facilities. The compound was surrounded by a concrete wall and sandbagged containers and gun positions. 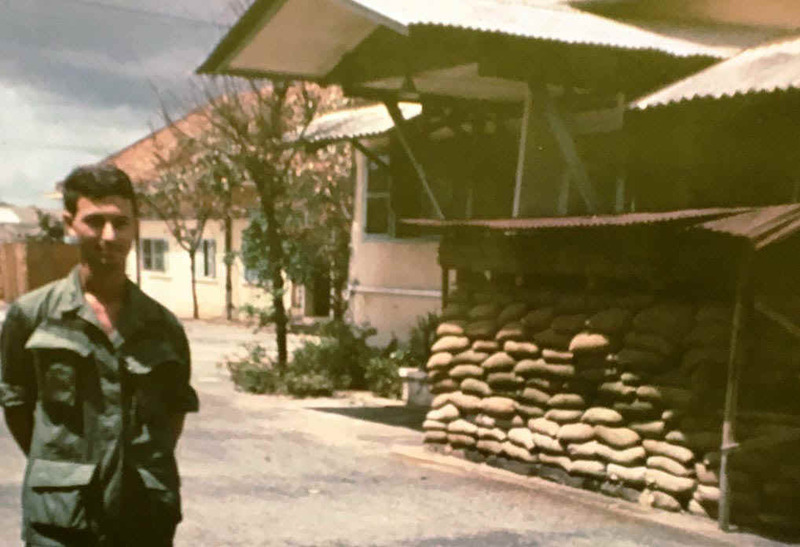 1LT Pollock stands to the left in front of the printing facility. A patriotic statue in front of another building displays a South Vietnamese soldier raising the flag while a second soldier works at rebuilding the country. The PSYWAR Department where 1LT Pollock was assigned engaged in activities contributing to the accomplishment of all three General Political Warfare Department missions. 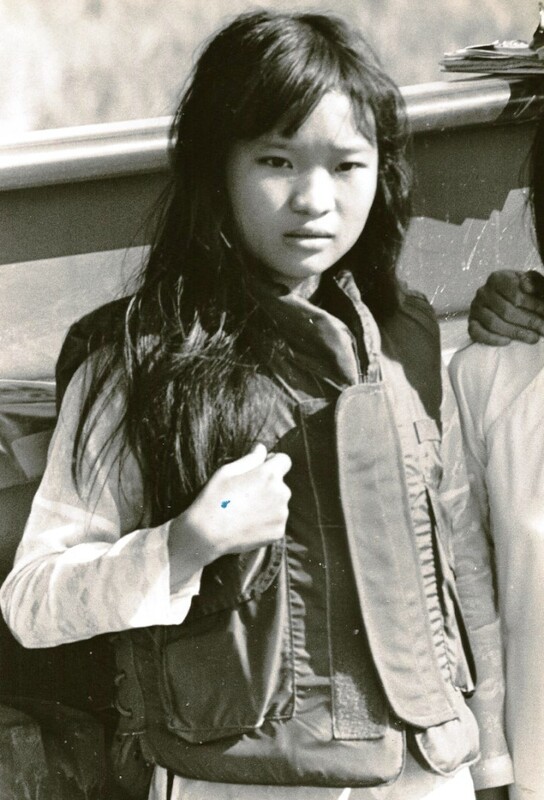 The Press and information office was responsible for writing and editing the RVNAF Magazine Tien Phong (Vanguard), Chien Si Cong Hoa (Republican Fighter), Chien Si Tim Hieu (The Fighters Information Booklet) and Tien Tuyen (the newspaper Front Line). 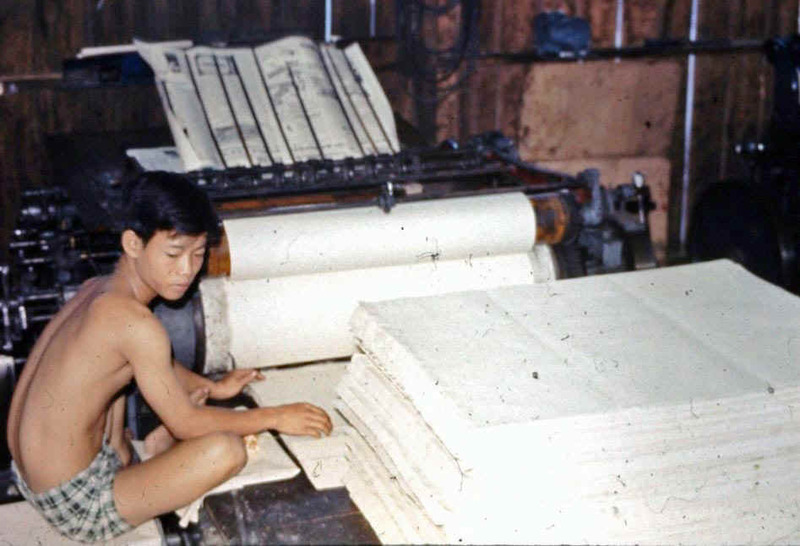 The Reproduction Office could produce 30,000,000 leaflets, 800,000 posters, 600,000 booklets or pamphlets, 100 banners, 600,000 Tien Tuyen newspapers and 10,000 miscellaneous documents a month. 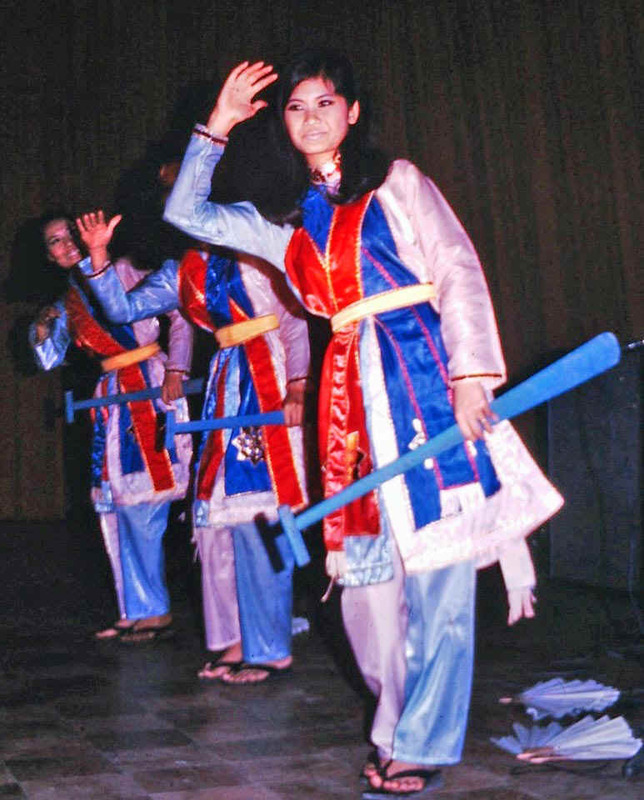 The young Vietnamese women depicted are part of the Cultural Drama teams sponsored by both the U.S. and Vietnamese governments. 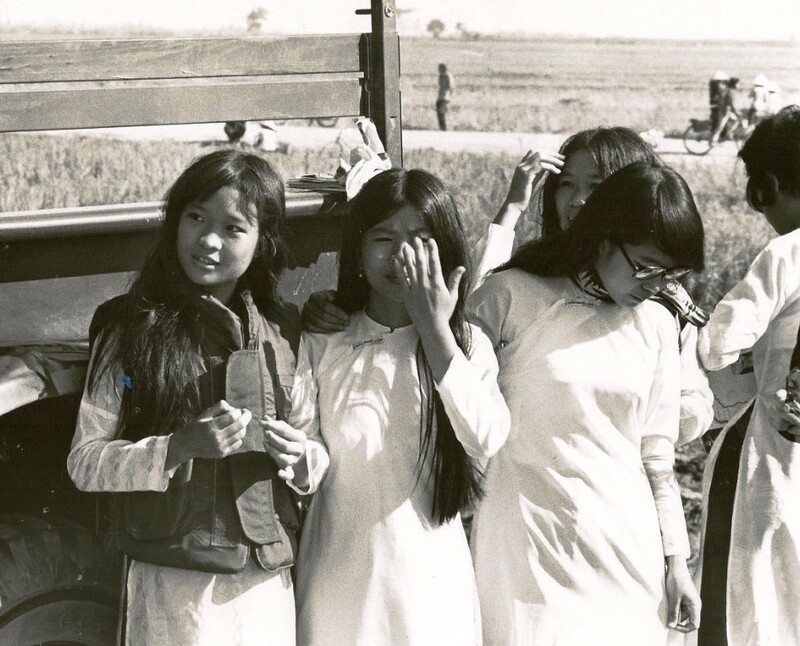 These girls are on the Vietnamese-Cambodian border in December 1971, on their way to entertain the troops during the Tet holidays. The Cultural Office assisted in the preparation of plans for entertainment and promotion of cultural activities and education within the Armed Forces by writing short skits, poems, dramas and songs, and by composing music for use by the POLWAR Battalion Cultural Platoons, for presentation on television, and for use on RVNAF radio. In 1969 while Pollock was in Vietnam, the GPWD received 62 slots for offshore political warfare training in the United States. Among the courses offered were: Psychological Basic Course, Information Operations Officer Basic Course, Chaplain Officer Basic Course, and a number of skill courses such as lithographic plate making, process photography, and similar technical courses. The purpose of this training was both to provide skilled technicians and to provide a base for the beginnings of similar schools in Vietnam. In addition the GPWD had liaison with the 4th PSYOP Group for special needs and training. I do remember Lt Pollack! He was coming in for some intelligence on certain areas to learn the identification of the enemy units in it and then they would develop leaflets addressed to those units. The government of South Vietnam established the General Political Warfare Directorate as their propaganda organ but there were problems from the start of the war. This was mainly due to differing priorities between South Vietnam and the U.S. Between 1964 and 1971, there were 12 different Vietnamese Ministers of Information and that created considerable problems with maintaining stability within the organization. 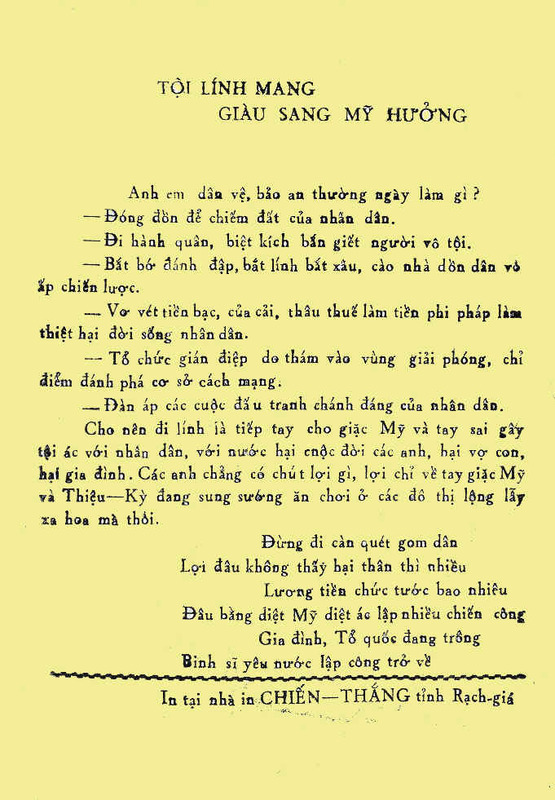 The Directorate was tasked with producing patriotic war songs, and anti-Communist plays and literature which depicted the heroic fighting spirit of the Vietnamese people. The GPWD controlled five POLWAR battalions. The mission of the Political Warfare Battalions was to provide POLWAR support to the RVNAF. This includes troop education, motivation and indoctrination, civic action, and PSYWAR support of tactical operations. The POLWAR battalions were composed of a battalion headquarters, an administration and technical company, a cultural platoon, and four POLWAR companies. The four POLWAR Companies were identically organized with a company headquarters, a POLWAR intelligence team, a political indoctrination platoon, and four psychological warfare and Civic Action teams made up of eight men each. U.S. forces were advised that because of the peculiar Vietnamese system, a POLWAR Battalion was not to be considered the equivalent of a PSYOP Battalion. Each Battalion worded in a different combat zone. For instance, The Vietnamese 10th Political Warfare (POLWAR) Battalion worked in I Corps with the U.S. 7th Psychological Operations Battalion. They shared the same compound in Da Nang and their printing facilities were integrated. The 20th Battalion was in II Corps at Pleiku, the 30th Battalion was in III Corps at Bien Hoa, the 40th Battalion was in IV Corps at Can Tho. Each of the four front-line battalions was tactically under the control of the Commander of the Tactical Zone they were assigned to. There was a 50th Battalion was held in Saigon in reserve. 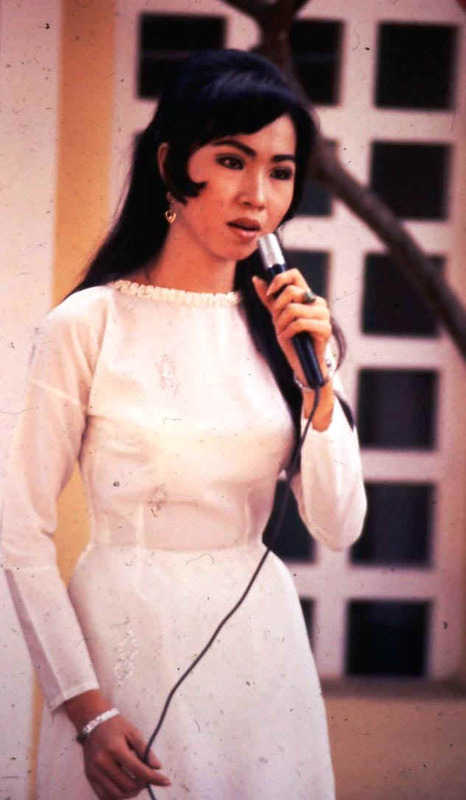 The Psywar Department had entire troupes of entertainers that were sent into the field to amuse the people and build their patriotism and remind them of the benevolent nature of the Government of the Republic of Vietnam. Besides singers, they had musicians, dancers, and even magicians. Pollocks Commanding Officer was Colonel Ruth. He is shown above with a Major from Nationalist China; also an advisor, as they watch and perhaps critique one of the musical shows put on by the GPWD entertainment troupe. The Chinese had two POLWAR advisors in each of the four combat zones, three at the Political Warfare College at Dalat, and three at the GPWD in Saigon. Colonel Ruth was among the best officers I ever came across in my life. His leadership style taught me a great deal. That led to my future success. The United States assigned about 18 advisors from the Army, Navy, and Air Force. There were also a number of Nationalist Chinese and Republic of Korea officers; but no enlisted personnel. 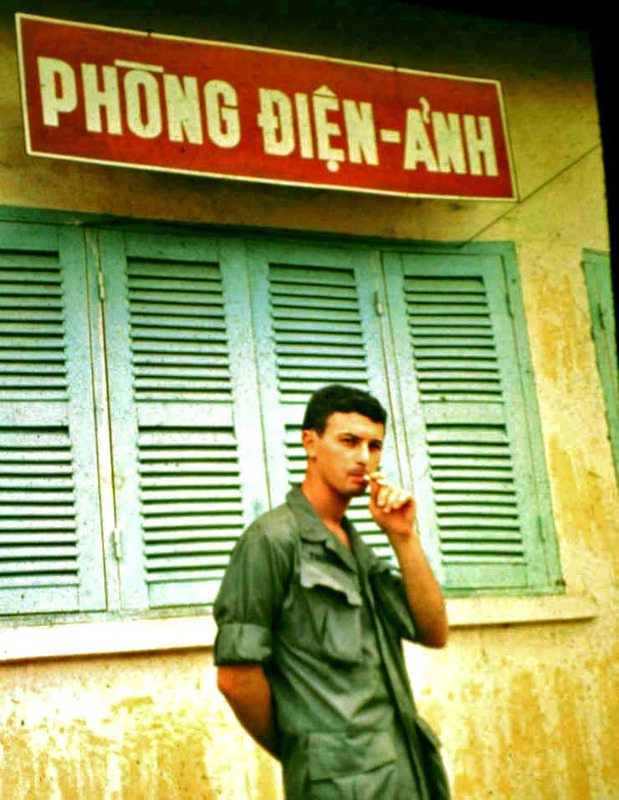 The advisors lived off the local economy; first in small houses, and later when credible security threats were received, they were billeted in small bachelor officer quarters all over Saigon. They were expected to blend in." Production of the Newspaper Tien Tuyen (the Frontline Daily). 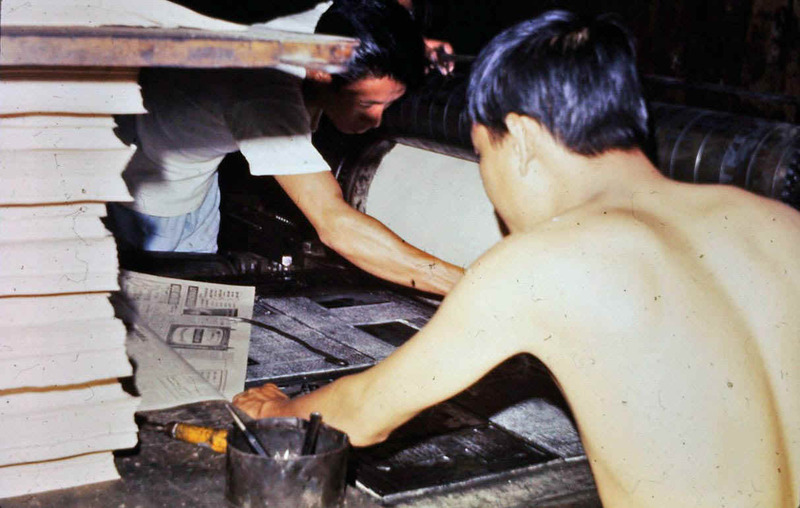 This Vietnamese printer hand-set type each day and then hand-fed the paper into old French era letter presses. The newspapers were then put together for distribution and the type was cleaned and the process repeated. The unit had reporters and editors in Saigon and in the field. One of Pollocks duties was going out in the field armed only with his military issue .45 caliber pistol and paying the staff from a bag of cash. He was warned to be cautious; the Viet Cong had placed a bounty on his head. 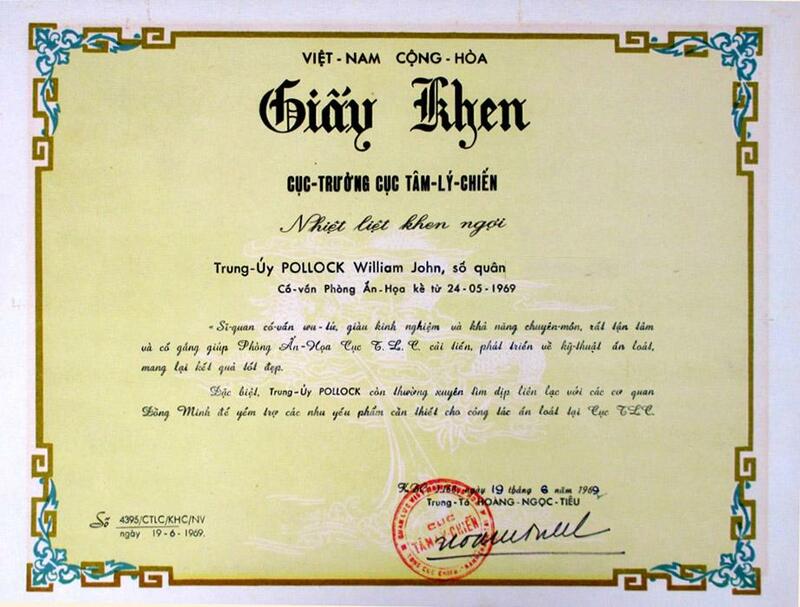 Pollocks mission was to provide technical and logistical support to the Vietnamese. The GPWD printed several daily newspapers, a magazine, numerous flyers, aerial leaflets, pamphlets and the large publicity banners strung up for various events. The banners were made for various patriotic celebrations and ceremonies, such as when President Nixon made an unscheduled five-and-a-half hour visit to South Vietnam on 30 July 1969. Their compound contained a TV studio and 16mm movie processing lab, editing and dubbing rooms and a radio studio. The Vietnamese did black (secret), white (acknowledged) and gray (no markings but obvious as to the source) propaganda and the Americans supplied technological support and liaison. 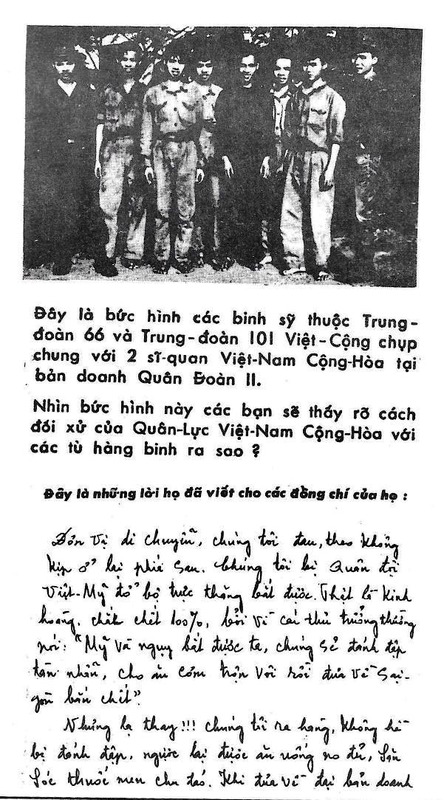 Viet Cong prisoners-of-war were interrogated for information and encouraged to defect to the government through the Chieu hoi (Open Arms) program. In the United States, politics and religion are kept far apart and it would be unheard of for a U.S. Army unit to make a statue of the Virgin Mary for a Catholic Church. In Vietnam, the monks, priests, churches and temples were part of the mission of the GPWD. 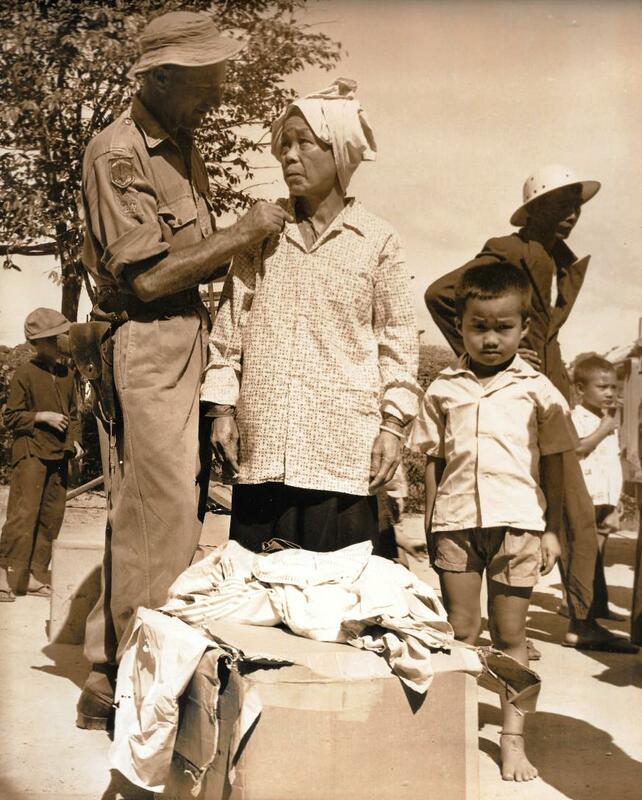 The Government of South Vietnam had no restrictions of aiding religion. 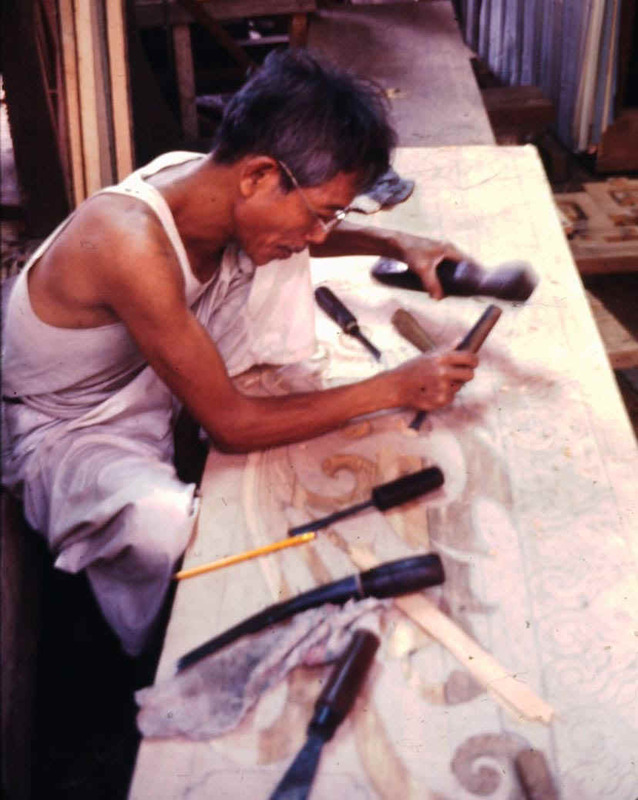 Here a military artisan carves a statue to go into a Buddhist temple. The GPWD had three Chaplain Directorates (Catholic, Buddhist and Protestant). The chaplain directorates were entirely dependent upon their own resources to organize, build and operate schools. The Government provided only the land. Speaking of artisans, the Vietnamese had excellent painters. Above we see the Chief Artist, Vietnamese Army Lieutenant Hoa. 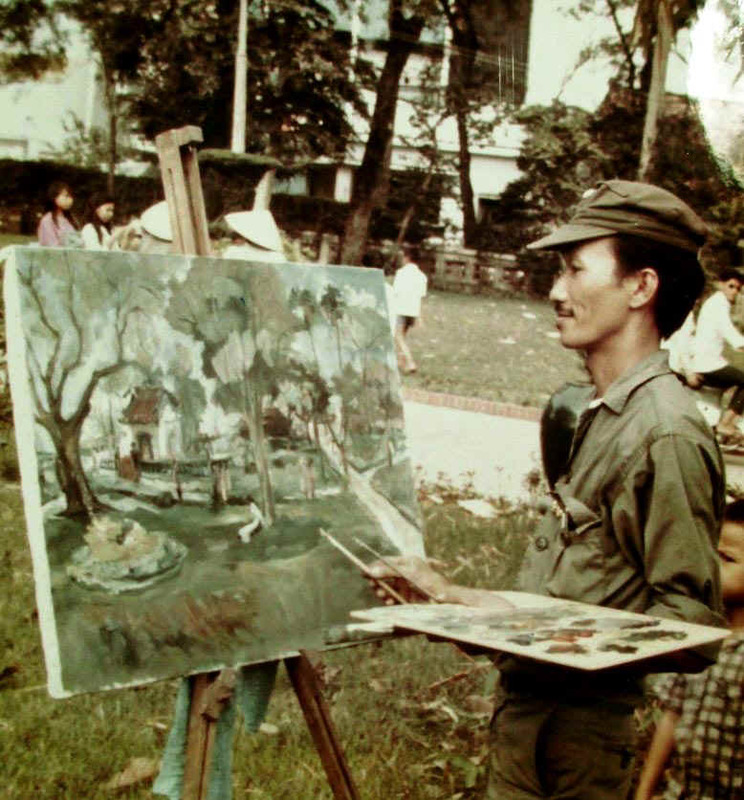 Above, we see him painting a Saigon public park scene about 1970. He was a classically trained artist and a master of oil paint, graphics and calligraphy who also dabbled in sculpture. He belonged to the Association of Serious Artists and exhibited his works with them. I have known several psychological operations artists and they all had classic training and had sold their painting and drawings as civilians. Above he works with oils and paints a beautiful Vietnamese scene featuring a home and surrounding landscape. Lt. Hai was a classically trained artist who specialized in oil paint, graphics, calligraphy and dabbled in sculpture. He also belonged to the Association of Serious Artists and exhibited his works there. 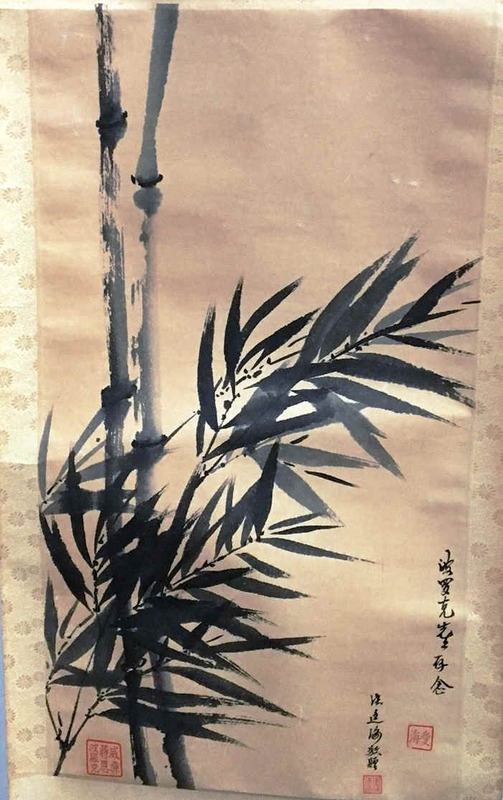 Lt. Hai taught Pollock Chinese Calligraphy and invited him to visit his studio on special occasions. The painting above is called The Remembrance. Lieutenant Hai painted it in 1969 and gave it as a gift to Lt. Pollock before he went back to the United States. 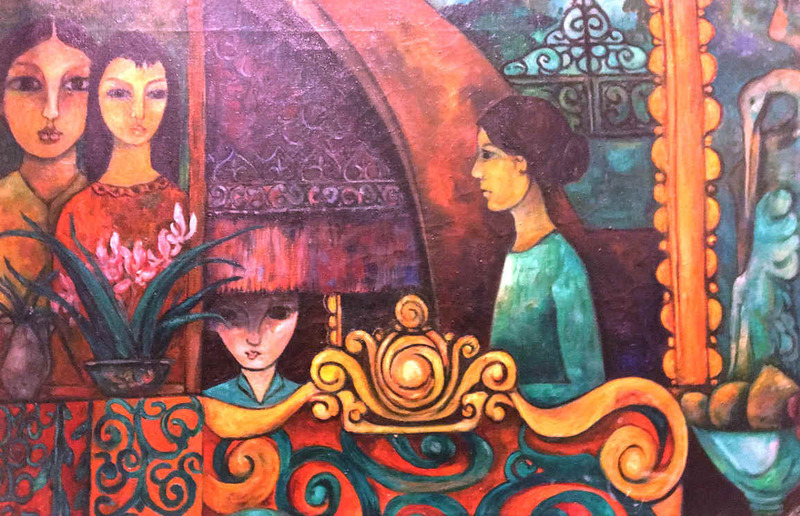 The painting is in a Vietnamese stylized format of three women, the grandmother, mother and wife or girlfriend of the young man at war. They remember him, but do not know where he is; his current condition, or if he is alive or dead. The young male is shown outside the window; away from his family, a very young androgynous figure with a short neck and male military collar. We dont know what side he is fighting for. 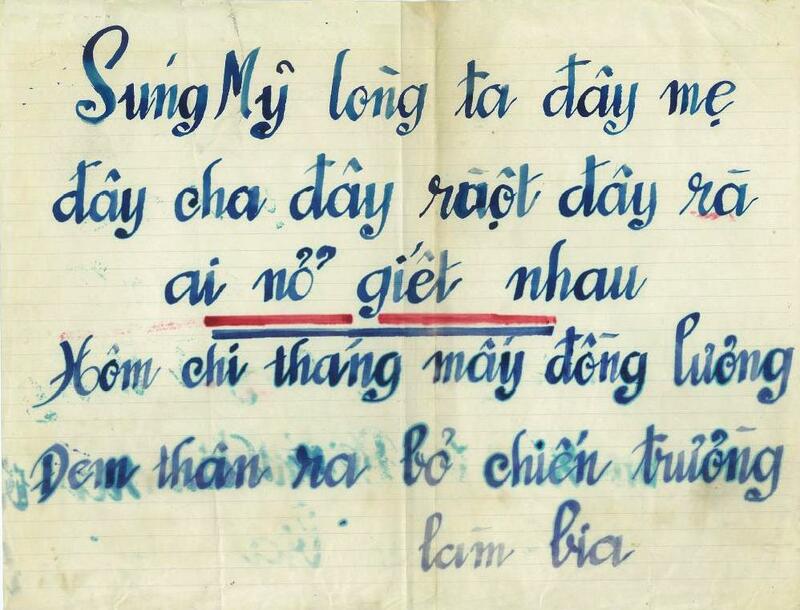 We mention above that Vietnamese Army Second Lieutenant Hai taught Pollock calligraphy. Here is a finished work by Pollock. His "chop" is at the lower left. Lieutenant Hai has added a comment at the lower right. Hai had the work mounted so Pollock could take it home. 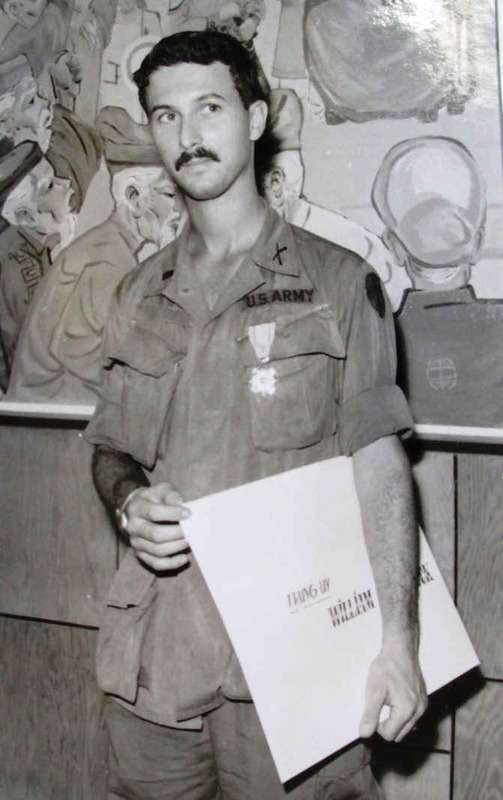 Pollock was awarded the Bronze Star and the Vietnamese Technical Service Medal awarded for outstanding initiative and devotion by individuals assigned staff duty. He said that the Vietnamese gave him a wonderful ceremony and reception along with the award. 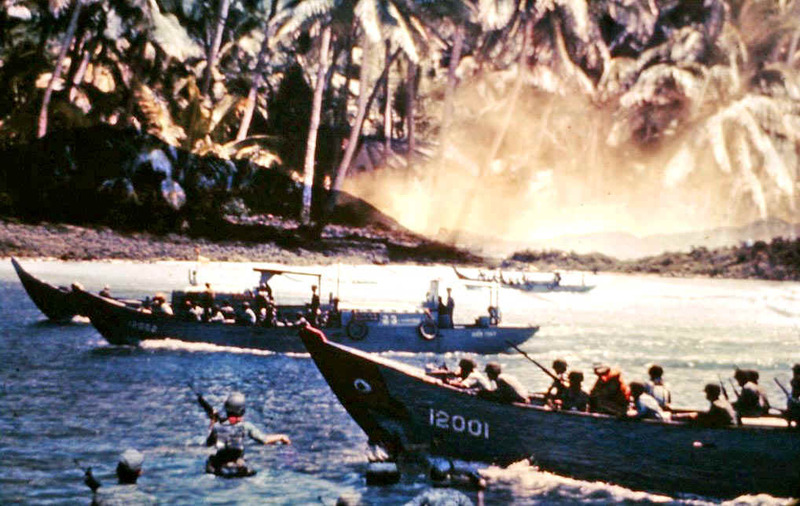 This patriotic photograph depicts Vietnamese Marines attacking a beach. In the background we see flames reminiscent of the napalm scene in the war movie Apocalypse Now. Pollock told me that it was a composite made from two 35mm slides mounted together to get the effect. This is a very impressive photo and sure to build up South Vietnamese pride in their military forces. PSYWAR Cadre must exploit current subjects by preparing rudimentary banners which point out the policy and announce the victories of our Army and the defeats of the enemy. The materials used to make banners can be any available materials such as charcoal, lime water, colored powder and paint etc... These are used to letter banners on walls, stones, or tree-trunks. The Army is one big family. He who has an ideal will be always young. Use individual life to prolong the national lives. 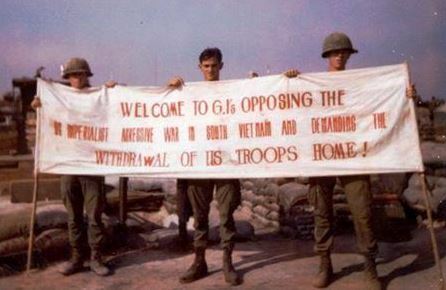 Welcome to the GIs opposing the U.S. imperialist aggressive war in South Vietnam and demanding the withdrawal of U.S. troops Home! American troops and their vassals must leave the South and then there will be immediate peace. Calendars are a wonderful propaganda product. A leaflet might be picked up, glanced at quickly and then thrown away. 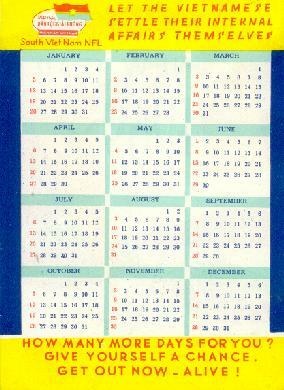 A calendar, if attractive and eye-catching, will be brought into a home and looked at for an entire year. Here a brave ARVN moves forward into flames and destruction. Looking through the three calendars my favorite page is this one. Both the North and South Vietnamese sent entertainment teams into the field. That makes sense because both the North and South Vietnamese learned their propaganda methods from the Chinese. The singers and dancers told stories, sang patriotic songs and performed some operas that were meaningful to the people. The title is intended to stimulate feelings of Vietnamese patriotism and opposition to outside aggression. At the time the Republic of Vietnam accused the North Vietnamese of being puppets of the Chinese Communists. The photograph was designed to boost military and public morale. Oppose the Communists' aggression in defense of our liberties as descendants of the Hong Lac race. Do as the two Trung sisters of the Trieu family did. Note: The sisters renamed their country Hong Lac during their reign. Let the Vietnamese settle their internal affairs themselves. How many more days for you? Give yourself a chance. Get out now - alive! This is a picture of soldiers from the 66th and 101st Regiment taken together with officers of the Republic of Vietnam and Headquarters, II Corps officers. In seeing this picture, you will know clearly how the armed forces of Vietnam behave with prisoners and ralliers. These confidential words are from the bottom of our hearts. We hope that you awaken very soon and not be afraid of anything. Take this paper and report to the Vietnamese armed forces or their allies, or any other governmental agency. You will be warmly received." Your friends failed in their plan to take Saigon. 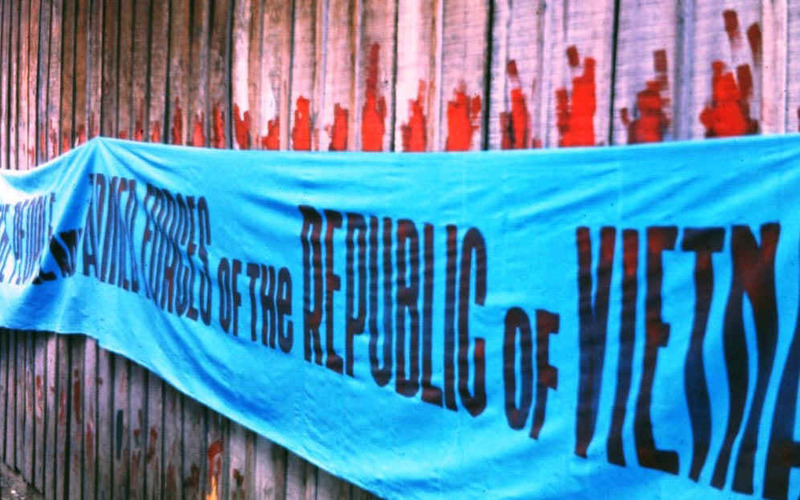 During the period 29 January to 9 February 1968, similar plans throughout South Vietnam also ended in complete failure. Almost 26,000 of your friends were killed and 5,000 more were captured. Your friends brought death and undying shame upon themselves when they inflicted pain and death on innocent mothers, fathers, brothers, sisters, and little children as they are joyfully greeting the sacred traditional Vietnamese Tet holiday. What do the Popular Forces and Regional Forces soldiers do every day? -They arrest people, beat them up, forcibly draft men into the army, flatten the people's homes, and force the people to move into strategic hamlets. -They steal money, steal property, and collect taxes to make money illegally, thereby hurting the people's livelihood. -They recruit spies to infiltrate the liberate zone and serve as informants to attack and destroy revolutionary organizations. -They suppress the people's just struggle demonstrations and protests. Therefore, to be a soldier is to help the American pirates and their lackeys commit crimes against the people and against our country. So, dear soldiers, you are hurting yourselves, you are hurting your own wives and children, and you are hurting your own relatives and family members. You get no benefit at all from this, because all of the profits from your activities flow straight into the hands of the American bandits and the Thieu-Ky clique who are now living lives of luxury and pleasure in the cities. Do not participate in sweep operations to force the people to move out of their homes; to do so would not be to your benefit and would instead hurt you greatly. Your own families and our Fatherland are now longing for patriotic soldiers to perform feats of arms for the revolution and to return to the waiting arms of the people. The GPWD printed a number of publications for the people to read. 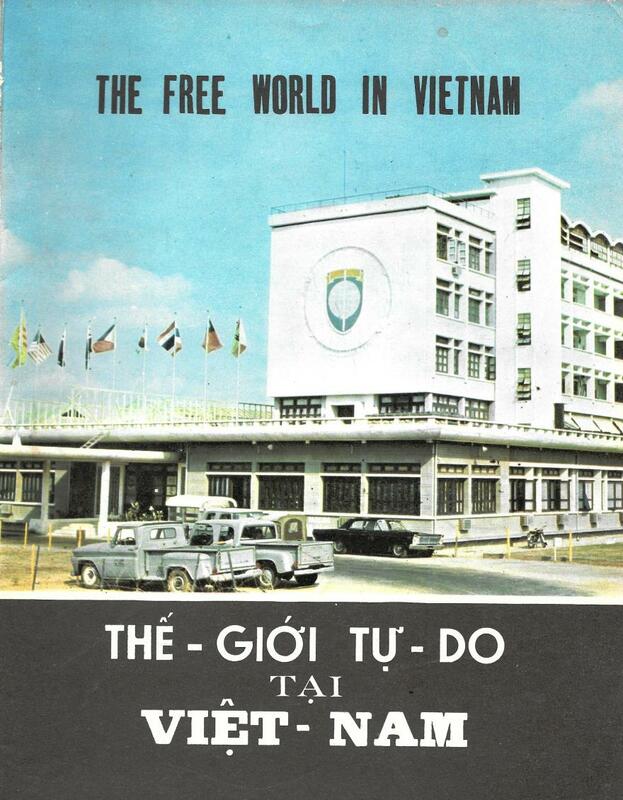 155,000 copies of The Gioi Tu-Do Tai Viet Nam (The Free World in Vietnam) were printed monthly. This was a general interest magazine, edited for educated adults and students. It is printed in both Vietnamese and English. 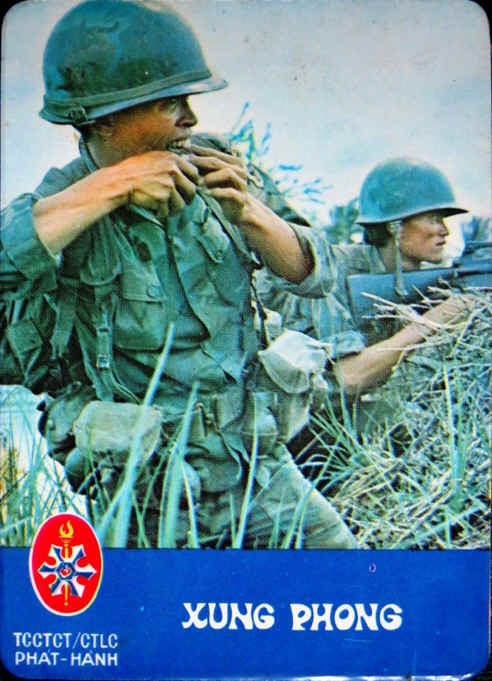 This 82-page 1969 issue of the magazine features the role of Free World forces in Vietnam. It mentions and shows numerous photographs of American, Australian, Republic of China, Korean, New Zealand, Philippine, Spanish, Thai and finally Vietnamese forces in action. Republic of China - A combatant of peace and freedom must be armed with strong thought. In early 1960, the Republic of Vietnam requested a Political Warfare delegation from the Republic of China to assist Vietnam. 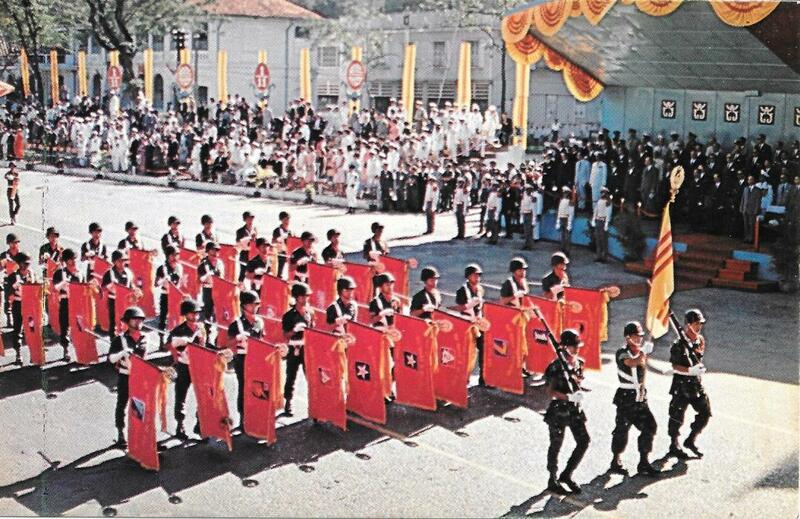 In 1964, the Republic of China sent a POLWAR group to Vietnam. The mission of the group is to assist the Vietnamese armed forces to develop and improve their political warfare organizations in political indoctrination, psychological warfare, social welfare, etc. The PSYWAR Directorate also published a monthly magazine aimed at indoctrinating its soldiers called The Republic of Vietnam Armed Forces. 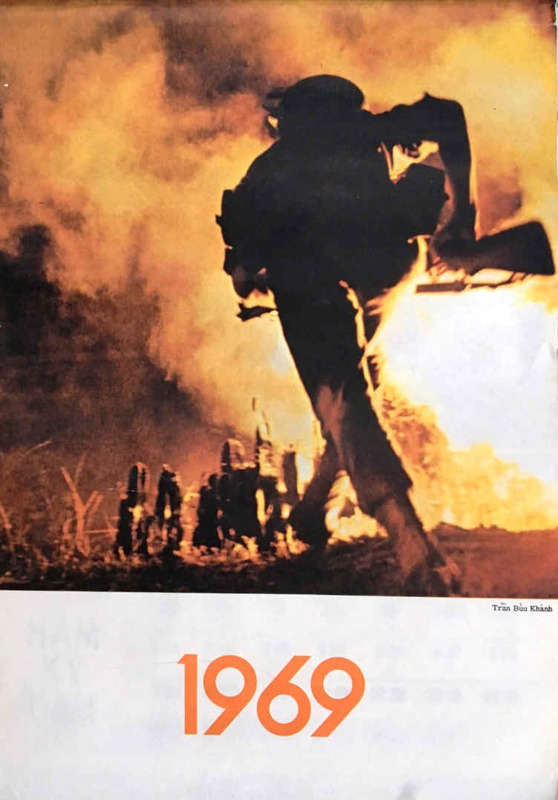 The magazine would focus on specific themes such as Communism in South Vietnam. The magazine was published in Vietnamese, English and French language editions. Coming back to the beloved nation. A small gift before starting the military life. As you might imagine, all of the Allied forces helping the Vietnamese wanted to have regular features in their propaganda magazine. 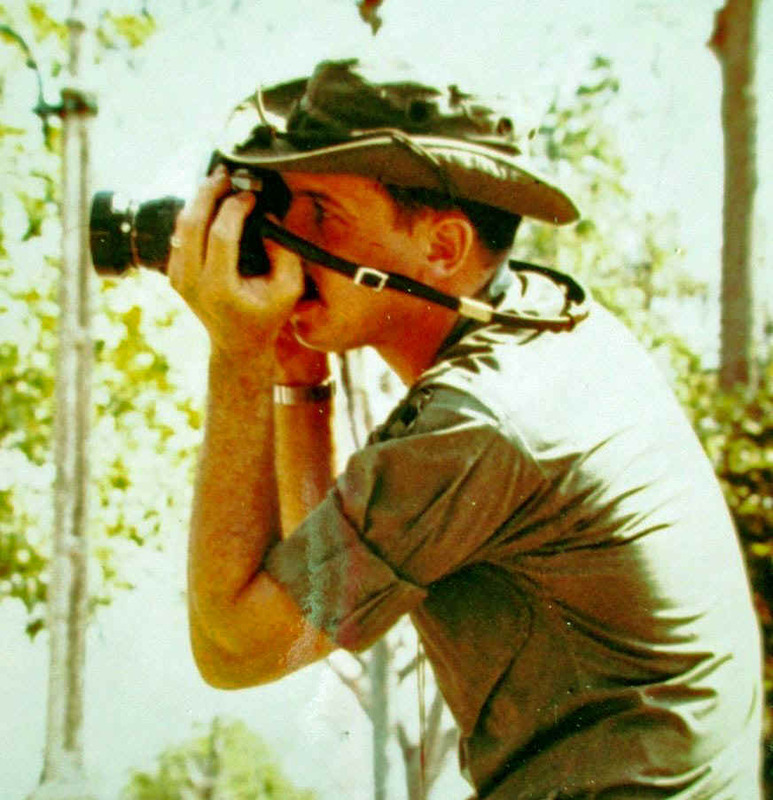 Pollock had a stack of photographs sent by the Australians for use in the The Free World in Vietnam. Many of them are military in nature, showing Australian troops behind machine guns or artillery or even in armored vehicles. This is a story about winning hearts and minds, so I chose one that depicted civil affairs at its best. It is said that the RSL was not happy when the Vietnam servicemen and women returned and wanted to join their organization. They thought that the only real wars were WWI and WWII. Those wars were won. Korea and Vietnam were not real wars in their eyes. And, they were not victories. This your war was not a real war belief was not unknown in the United States. I joined the American Legion and the Veterans of Foreign Wars in the early 90s when I finally retired and rose to command both local posts. When I approached Korean War and Vietnam War veterans they told me that they had been barred from joining in the past because they didnt win their wars. I made them feel welcome and brought many in, but it was shocking to hear that some of the old WWII vets and banded together to keep those young veterans out. I found it hard to believe that one veteran could treat another that way. Printers of the GPWD set the type in the old French press. This was a time-consuming daily job for the printing staff. The GPWD printed 25,000 copies of the newspaper Tien Tuyen (Front Lines), each day for soldiers and civilians. They were free to all military personnel. 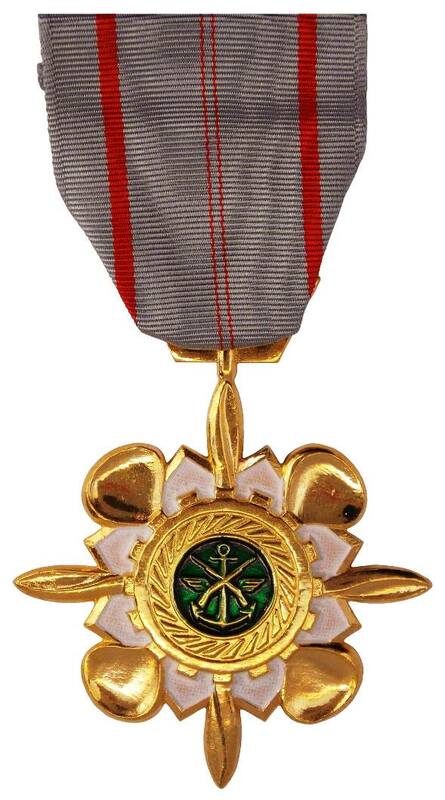 It was considered the unofficial voice of the Vietnamese armed forces and was usually pro-United States. It generally covered Premier Thieu in greater depth than the other newspapers. Assemble the company to listen to the reading of newspapers, but choose favorable occasions to read. Each reading should not exceed 15-minutes. The articles are chosen by POLWAR Officer for reading. Loudspeakers can be used for the reading of newspapers if the unit has a sound system. In case the unit is divided into small groups the POLWAR Officer will assign assistant cadres to read newspapers to each group. POLWAR Officers should organize a brief analysis of important events once a week or every two weeks. Conduct a test on current problems using simple questions and answers, or puzzles; and give prizes to soldiers who have correctly answered the questions. This will sow enthusiasm among the soldiers. The four postcards depicted here were made from Tran Buu Khanhs photographs. He was a Vietnamese Army enlisted man and combat photographer and part of General Political Warfare Directorate's still photo lab. They were also used in the full color calendar pages showing quality of life scenes to boost military and public morale. 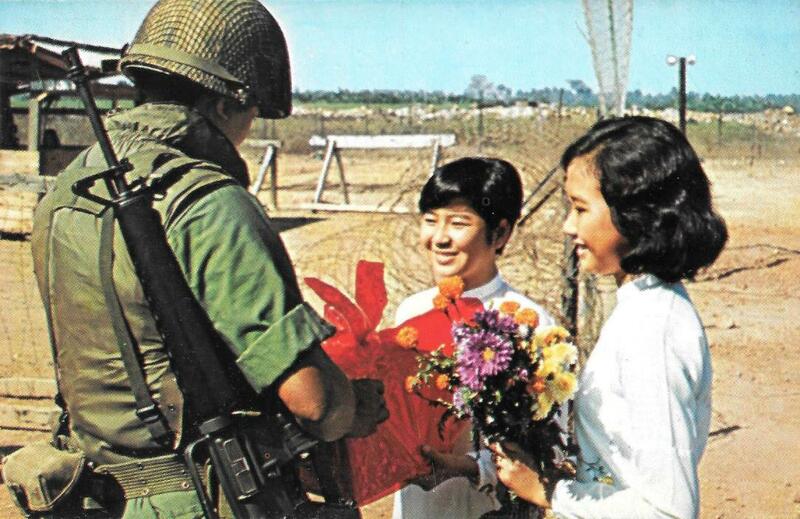 In the above photograph two young women give a soldier a Tet gift of flowers and a box wrapped in red cellophane and gold foil. 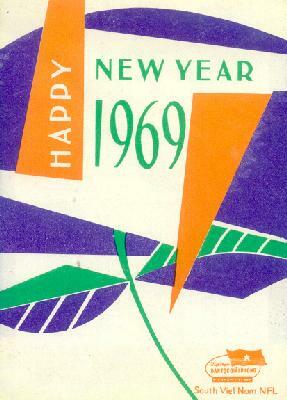 This was used in the January 1970 calendar page. 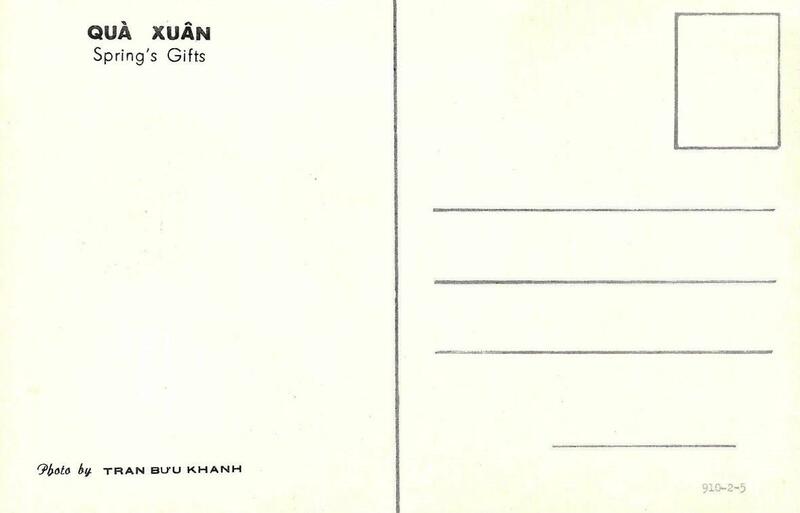 Each card has the title in both English and Vietnamese on the back, the photographers name and a code number, in the case of all four cards the same: 910-2-5. The cards are rather small by current American standards, about 138 x 88mm. 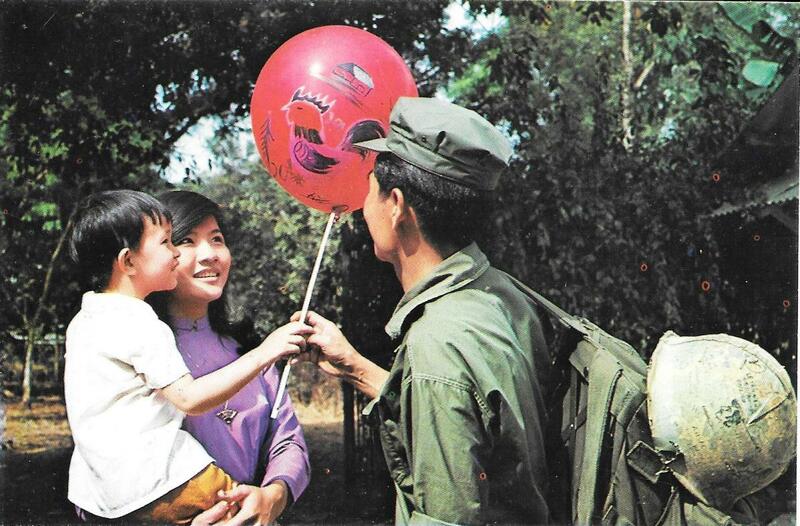 This postcard depicts an ARVN soldier giving a decorated red balloon to his child in his mothers arms. It shows the kindness and generosity of the soldier and his love for his family and the people he protects. 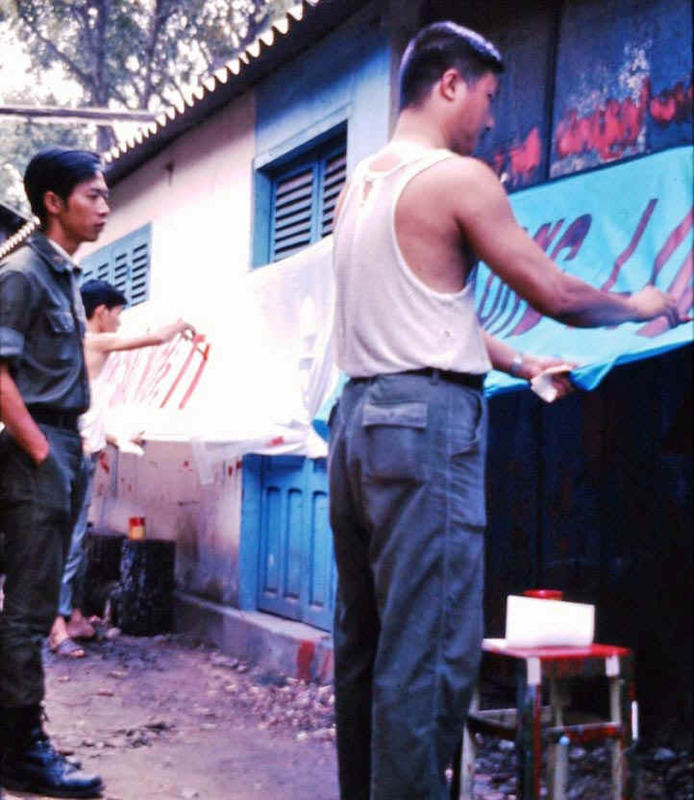 By the way, notice the graffiti on the Vietnamese soldiers helmet. 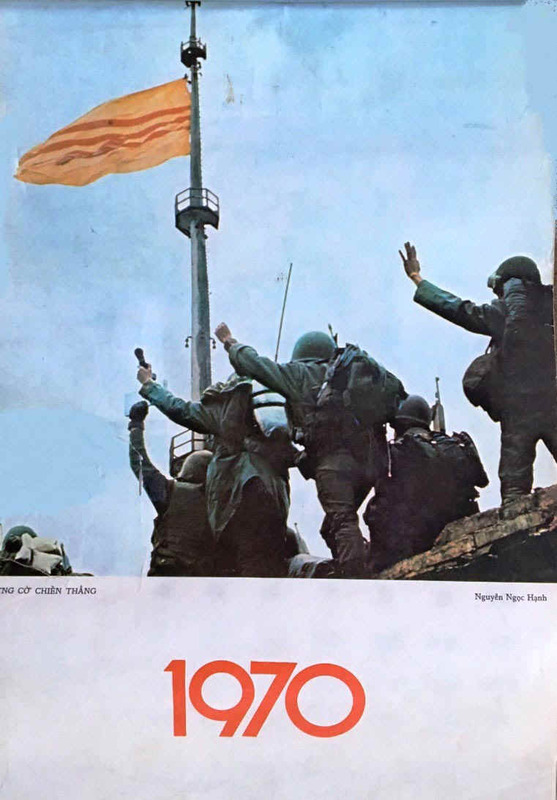 This photograph appeared on the October 1970 calendar page. 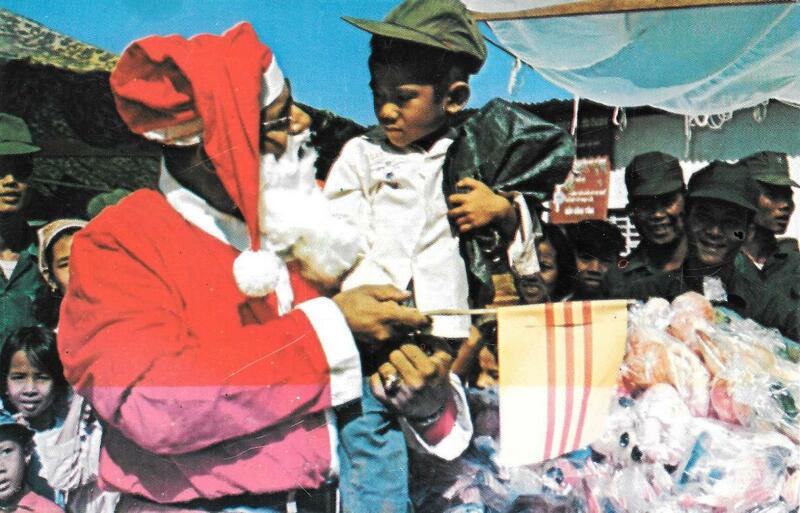 This picture depicts Santa Claus, who looks suspiciously like a black American soldier, holding the flag of the Republic of Vietnam and a young Vietnamese child. In the background you can see ARVN soldiers and their children and bags of gifts and fruit which will certainly be given to the children. The last postcard in the four-card set shows Vietnamese troops marching on their National Day. This is the only image that is patriotic in nature rather than showing the friendship between the ARVN and the people of Vietnam. National Day was a national holiday in Vietnam observed on 2 September, commemorating the Vietnam Declaration of Independence from France on 2 September 1945. 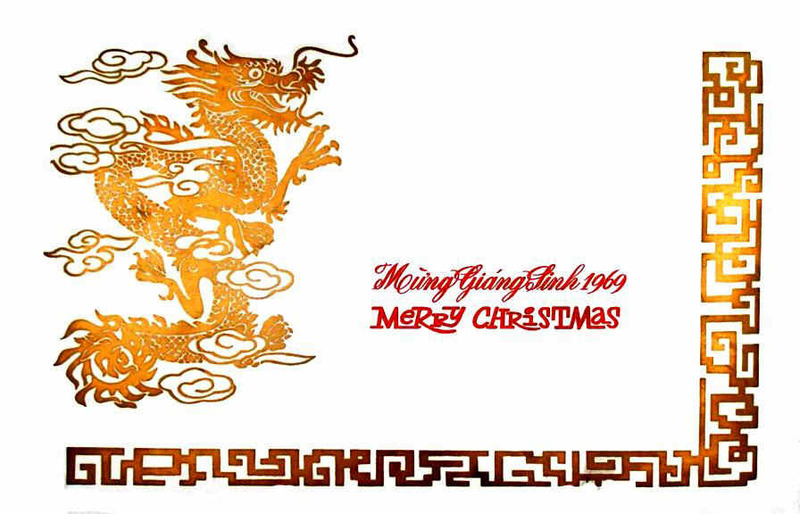 On behalf of the government and people of the Republic of Vietnam, I sincerely extend to all our Allied comrades-in-arms my best wishes for a Merry Christmas and a Happy New Year. The people of the R.V.N are deeply moved by your supreme sacrifice for you have had to leave your loved ones and Fatherland to help the R.V.N. in its fight against Communist aggression and to preserve its freedom and independence. I believe that the joint efforts of the Allies and the R.V.N will soon bring peace to Vietnam. 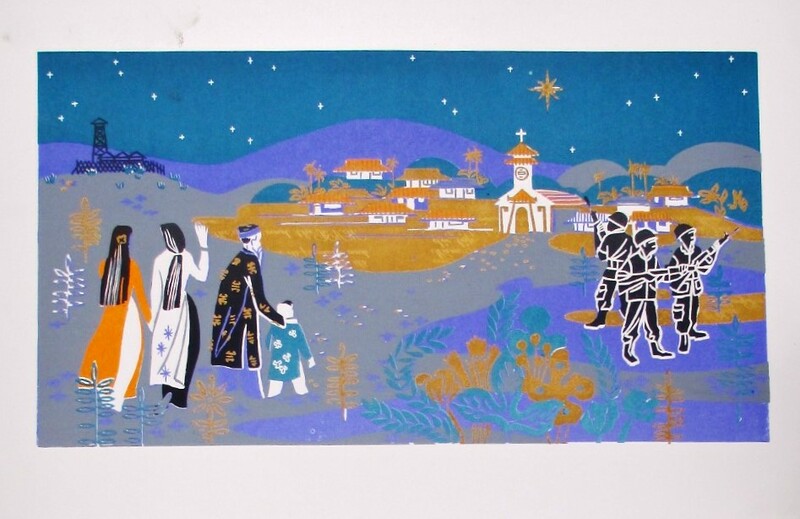 Pollock said that he did not remember a large quantity of these huge Christmas Cards and envelopes being printed. He was surprised to get one since he was only a 1st Lieutenant. He thought that all the Military Assistance Command - Vietnam leadership at Headquarters and the U.S. Embassy staff got them as well. The card was quite large at about 9.75 x 14.75 inches when folded. When fully opened the card was about 19.25 x 14.75 inches. That is by far the largest Christmas card I ever saw, about the size of a large college diploma. The envelope that it was mailed in was an enormous 15.5 x 11.5 inches in size. The President of Vietnam did nothing in a small way. The card was king-sized and determined to get your attention. I had hoped that 1LT Pollock would have saved some well-illustrated posters showing patriotic scenes. Unfortunately, the ones he saved were all text, almost looking like banners. Still, nobody has ever depicted a GPWD poster to my knowledge, so I am happy to show these two. 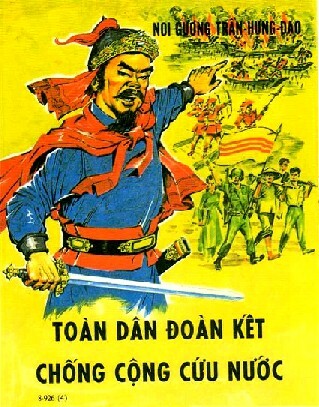 The Vietnamese PSYOP troops were taught that the contents of information posters must be in accordance with political educational subjects; the content could be divided into these topics: mission, education, enemy situation, praising good personnel and good jobs, explanation of questions, introduction of new music and cartoons, etc. There are many forms of information poster, but they can only correspond to the units ability. They must also be good looking and concise. Why do you use the American weapons in order to shoot and kill your father, mother, relatives and your people? Every month, with the insignificant salary you are paid, why are you sent to the battlefield? Laborers, farmers and soldiers unite in order to fight against the American terrorism. Soldiers; you should not oppress the people. What fault, what mistake did our people commit so that they were shot and killed? 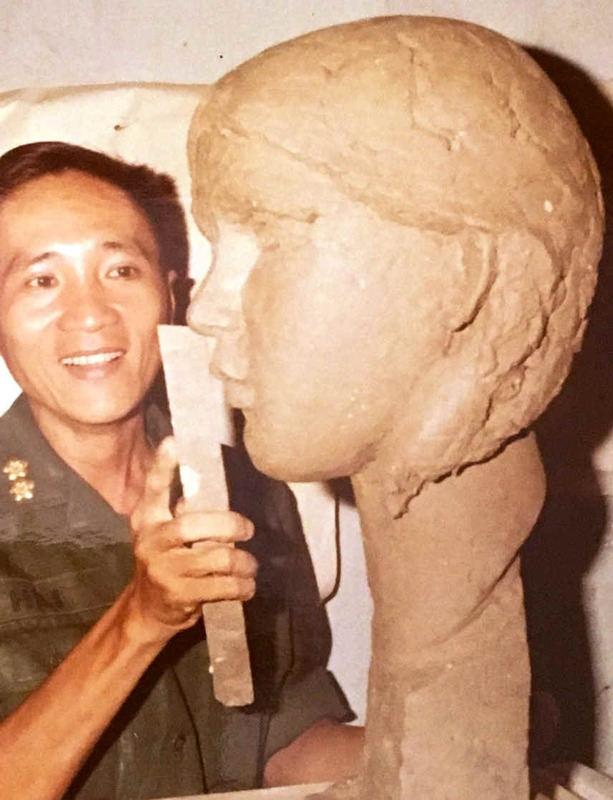 Second Lieutenant Hai sculpting a clay bust at the General Political Warfare Directorate studio in 1969. Normally I would not place this in the Product category, but upon completion, the clay sculpture will be cast in Bronze salvaged from the brass of expended artillery shells. The statues will then be placed in Buddhist Temples being built and repaired by the GPWD as part of their religious mission. Lt. Hai also did a small sculpture of Madonna & child about 1970, Cast in concrete from clay with a black printers ink patina. I assume that was for the Catholic Chaplain. Hai also did a very large statue of a sitting figure that appears to be Vietnamese General Tran Hung Dao. 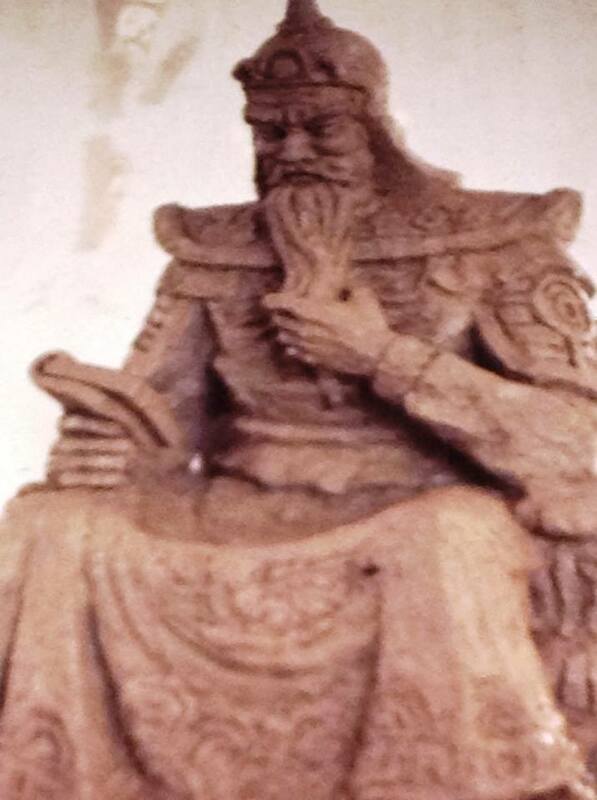 He commanded the Vietnamese armies that repelled three major Mongol invasions in the 13th century. His multiple victories over the mighty Mongol Yuan Dynasty under Kublai Khan are considered among the greatest military feats in world history. Tran Hung Dao is regarded as one of the most accomplished military tacticians in history. This is a fitting memory by Hai. The reader must understand that as part of its mission to lift the morale of the Vietnamese soldier, the Chaplain Directorates are three separate, autonomous entities responsible directly to the Chief, GPWD. The Directorates are Buddhist, Catholic and Protestant. They are responsible for providing for the spiritual welfare of the service members and families, providing educational facilities by organizing, building, and operating schools, and providing social welfare services to military personnel and their dependents. 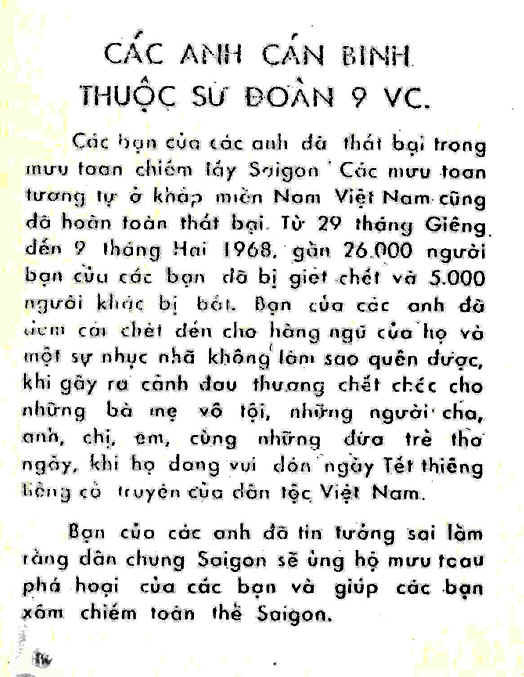 One Vietnam trooper stated that the ARVN 10th Political Warfare (POLWAR) Battalion distributed these leaflets to the Vietnamese people in 1968. 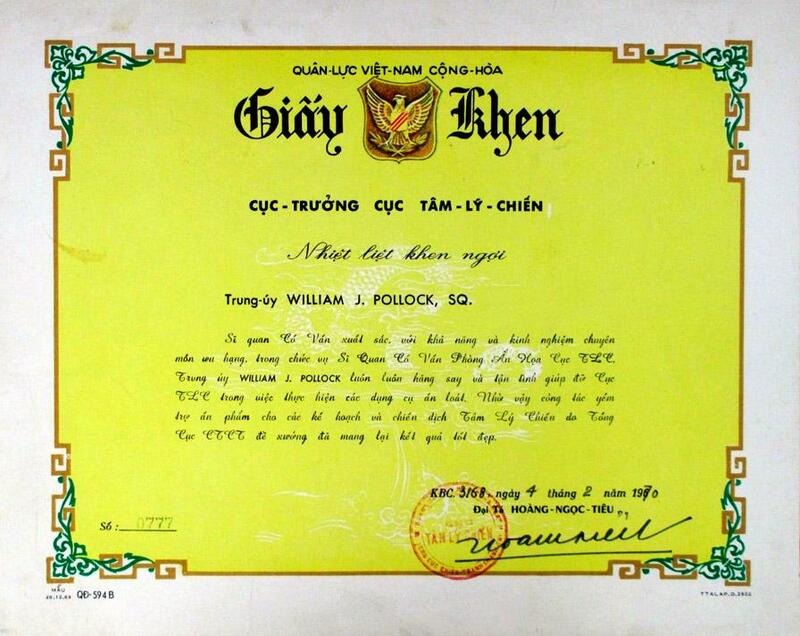 When First Lieutenant William J. Pollock finished his tour with the Psywar Department of the General Political Warfare Directorate in Saigon as a printing and publication advisor in 1970, the Grateful Republic of Vietnam awarded him several certificates. Because they are so seldom seen in the United States, I thought we might show some of them. This first certificate is rather large at 13 x 10.5 inches. The Chief of the Psychological Warfare Department highly praises 1st Lieutenant William J. Pollock, an outstanding and devoted officer. 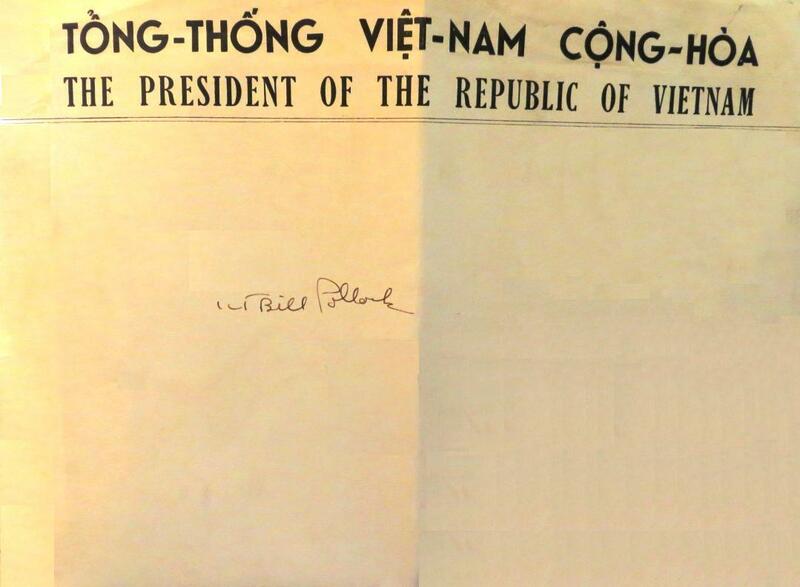 As advisor to the printing office from 22 May 1969 to 16 May 1970, Lt. Pollock has actively assisted the Psywar Department to improve and develop its printing branch by contributing useful ideas and providing technical guidance to the Vietnamese printing specialists. 1st Lieutenant Pollock has contacted other U.S. agencies to request support in needed agencies to assist the Psychological Warfare Department obtain desired results in the field of printing. Pollock told me that the real meaning of that second paragraph was because his best friend from High School was the officer in charge of the Bachelor Officers Quarters in Long Binh and he was able to run up there a number of times with a convoy of deuce and one half (two and one half ton) trucks to pick up excess material for the General Political Warfare Directorate. He would bring back their excess broken bags of concrete, bed frames, mattresses, and other items that were destined for the junk yard. It was helpful with housing refugees and families of ARVN and the local Buddhist Monks rebuilding their temple. The certificate writer was very diplomatic in his writing. In other words, Pollock was able to get a lot of needed extra things done. An outstanding advisor with outstanding abilities and professional experience, Advisor to the Psychological Warfare Departments Publications and Illustrations Office, First Lieutenant William J. Pollock enthusiastically and whole-heartedly helped the Psychological Warfare Department in its work of producing printed materials. As a result of his efforts, the work of providing printed materials for use to support the plans and campaigns of the Psychological Warfare Department has produced excellent results. The author encourages readers that wish to comment on this article to write to him at sgmbert@hotmail.com.